Several departments at Georgia Southern University have teamed up to host the Georgia International Conference on Information Literacy at the Coastal Georgia Center in Savannah, Georgia, on Sept. 15-16. The mission of the conference is to provide the opportunity to share research and best methods related to teaching, learning and assessing essential lifelong learning skills. 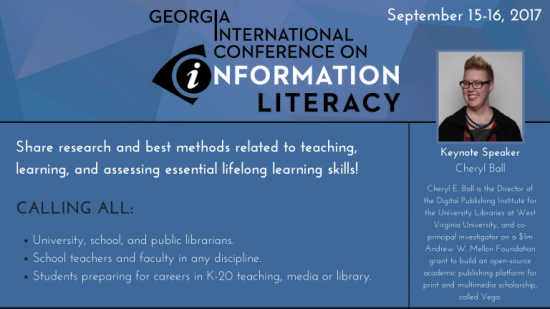 This conference is open to all information literacy and media professionals, educators, scholars, library specialists and anyone with a passion for learning how we share, receive and communicate with one another. Attendees will experience workshops, webinars and roundtable discussions in various breakout sessions. Cheryl Ball will serve as the conference’s keynote speaker. Ball is the director of the Digital Publishing Institute for the University Libraries at West Virginia University, and the co-principal investigator on a $1 million Andrew W. Mellon Foundation grant to build an open-source academic publishing platform for print and multimedia scholarship. The conference is jointly hosted by Zach S. Henderson Library, the College of Business, the College of Education, the Department of Writing and Linguistics, the College of Liberal Arts and Social Sciences, and the Division of Continuing Education. For more information, or to register for the conference, visit http://academics.georgiasouthern.edu/ce/conferences/infolit/.